Stop us if you have heard this story before. Your son or daughter sits down at the table to start studying for an upcoming test. Within five minutes, they are answering a text message, digging through the fridge for a snack or petting the dog. They get back to studying only to stop and scroll Instagram 10 minutes later. We are sure this is a familiar story. If you are the parent of a teen, knowing how to keep them focused and avoid distractions when studying is important. When you understand what helps them stay on track, it will make a huge difference in their exam results. 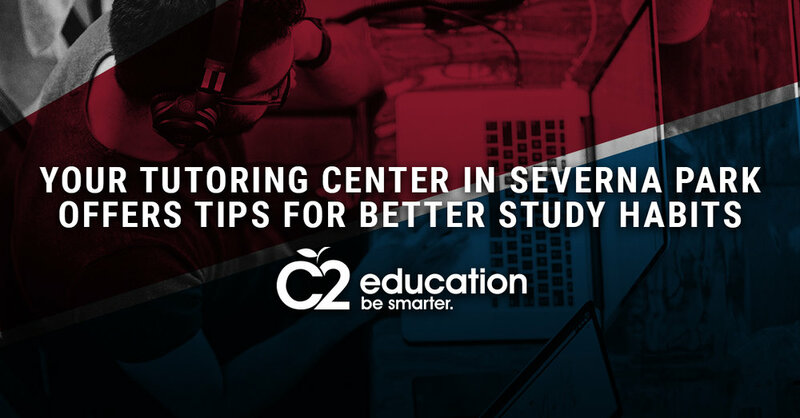 C2 Education, your tutoring center in Severna Park, offers these tips that will help your teen avoid distractions while they study. This is pretty obvious; lose the smartphone. It is not enough to put the phone on silent mode, it will still be a distraction as long as it is in sight. Your best bet is to confiscate the phone while the student is studying and put it in a safe place. If there is a tablet or laptop that is being used to study, we suggest that you turn off the WiFI for the duration of the study session so there are no distractions. You can be a big distraction and not even know it. You could be in the kitchen wiping things down and humming a tune, which is a huge distraction if somebody is sitting at the table trying to study. Peel yourself away from the kitchen and do some light reading in the bedroom until study time is over. Even if your teen is studying in a room that isn’t particularly noisy, noise-canceling headphones are still pretty amazing. Headphones do a great job blocking out noises that are cause for distraction including the hum of a washing machine, footsteps in the upstairs bedroom and Fido barking at a squirrel. For some teens, the sound of silence can be deafening and they study a whole lot better listening to music. However, they need to choose the music they listen to wisely. For example, rock songs with lyrics could be quite distracting while strictly instrumental music, like classical, could improve concentration. Before your teen sits down to study, have them go through a checklist of things they need and have them handy. This list should include pencils, pens, rulers, scrap paper, highlighters, everything they need for their study session. The list should also include a glass of water and any snacks they might want to nibble on. The idea is to have everything they need up front so they don’t have to stop studying to get the things they need. Teens are known to be hungry all of the time. Before your teen sits down for a study session, make sure they eat a big, healthy meal. It is easier to study on a full stomach. And if your teen needs tutoring, call C2 Education. C2 Education, your ACT prep service in Severna Park, offers these common college myths that you shouldn't believe. When your children turn into teens, the whole world changes. No longer is their favorite song Frosty the Snowman or their favorite holiday activity decorating the tree. Nowadays, they prefer listening to pop tunes on their iPhone and hanging out with their friends. Anything beats having to hang out with the parents during the holiday season. Well, you can change all of that. All you need to do is set up some holiday activities that your teen will love. C2 Education, your college prep service in Severna Park, offers holiday activities your teen will love. There are plenty of movies that your teen still can’t watch too many times. Discover their favorite movies, pop plenty of popcorn and have a holiday movie night at your home. Go ahead, show them the classics and see what happens. We are willing to bet there are movies from the past that your teen will love. Take your teen on a nature walk. You can also take them out to where you can track down and saw down your own Christmas tree. Outdoor activities are healthy and even familiar places look different in the winter. Christmas is the best time of year to bake all of your favorite goodies. Your never too old to eat baked cookies and other goodies and your teen can help. Pick an afternoon to crank up the oven and have a bake-off with your teen. It can be as simple as baking pre-made cookie dough you buy at the store or whip something amazing up from scratch. This is fun for the whole family. Set a monetary limit and have all of the family members go out and buy the worst possible gift. The one who chooses the best worst gift wins. Let your teen choose one of their favorite games and spend an evening in a tournament. Going head to head with your teen on a PlayStation or Xbox game is a great way to bond and create memories that will last a lifetime. Fondue is not only fun, but it is also a great conversation meal. Let your teen help you choose what fun recipes to try. They will never admit it, but your teens never fell out of favor decorating the tree at Christmas. Give them some decorating responsibilities that will keep them entertained and busy. Don’t forget the hot chocolate and cookies. A good way to clear some space in your teen’s closet for the clothes they will be getting over the holidays is by giving outgrown clothes to charity. Go through the wardrobe with your teen to gather and donate clothes that no longer fit them or are otherwise never worn anymore. This is also a good time to talk about the importance of giving. C2 Education offers tutoring and college prep to help make the start of school in the fall more fun and more successful. Contact us today. If your teen is stressing out over homework, it could be a sign they need a tutor. C2 Education, your college prep and tutoring service in Severna Park, offers signs your son or daughter might need a high school tutor. There is a very good reason why we have stereotypical views of modern teenagers as lazy young adults who only desire to play video games, sleep in, hang out with their friends and spend a huge amount of time on their smartphones. The reason is that much of it is quite true. This is what parents see their teens doing. In fact, the image of the lazy teenager is so embedded in our minds that people think it is a natural consequence of adolescence. And while such thinking is completely understandable, it is also misguided. Long before video games, shopping malls and high schools, teenagers were expected to put in a full day of hard work, just as adults did. Teens did work hard and took on the responsibility of cooking, cleaning the house and helping out on the farm. Of course, they did this because the chances of going to college and becoming something you want was quite slim. Things have sure changed a lot. But despite these changes, teens are still the same. The only thing that has changed is in the context of what teenagers are expected to do. While very few teens completely lack motivation, most of them lack the motivation to do things that aren't important to them. C2 Education, your ACT prep service in Severna Park, offers ways in which you can motivate your teenager. Tell your teen if you see a difference between expectations and achievements. You may have set a pretty high bar and when your teen fails to reach it, you become disappointed. However, your teen may feel that even though goals weren’t reached, progress was made and the effort was there. Think about the things in your teen’s life that motivates them. Perhaps it’s their vehicle or a sport they play or the music they listen to. Ask them questions that prompt them to think about ways in which they can transfer that motivation across to places where they lack motivation; like studying for example. Instead of feeling disappointed at your teen's shortcomings, highlight their strengths. Tell them how proud they make you when they pay attention to detail when washing their car or putting on their makeup or how they have the natural skills of a skateboarder. There is a lot of pressure being a teenager, this is something you may have forgotten. Reduce the emotional overload of being a teen by asking how you can best support them and help them relieve the pressure. When your teenager is struggling to stay focused, remind them that you were once in their shoes with very similar problems. Then break things down into manageable steps and work together to succeed. Praise not only the small improvements you see in your teen, but the effort put forth as well. Let them know you value what they are doing and reward them when they reach goals. C2 Education is the smart choice for students who want to do better. Contact us today. Back to school doesn't have to be a drag, there are plenty of things to look forward to. C2 Education, your college prep service in Severna Park, offers the reasons you should be excited to go back to school this fall. There is no magic formula for getting into the college of your choice. But there are things you can do to better your chances of landing at your favorite university. Whether you have just begun considering which college you want to attend or if you are a student who has dreamed about a particular college for a long time, you have probably been searching for ways to make yourself stand out from the average student. C2 Education, your SAT prep service in Severna Park, offers tips to getting into your school of choice. Colleges will say they are very interested in the real you. While this might be true, they don’t want to get to know the real you if your grades and test scores aren't up to their high standards. Basically, you can be the most interesting person in the world and that won't matter if you don't have good grades and score low on test scores. Colleges are overwhelmed by slick and boastful essays that only offer the top layer of an applicant. Colleges want applicants to go deep and give them a real picture of who you are. Am applicant should come off as someone who is a difference maker as opposed to writing a mere list of awesome accomplishments. Many colleges are interested in increasing access. So it might be to your benefit to emphasize your background. For example, perhaps you are a low-income student or the first in your family to attend college. Admissions offices are thinking harder about socioeconomic context, so tell them about the challenges you have faced. You might be interested in becoming an engineer, but you have a love and passion for art or music. That is good stuff to put in your college application. Showing your interests in hobbies offer different facets of yourself. We get it, when you are young, you do some things that aren't always smart. Take a good look at your social media accounts and make sure you haven’t posted anything that could come back to haunt you. Because you can bet the admissions office is going to creep you. Even go as far as to make sure your email address, the one you made in the 8th grade, has no mention of beer or drugs or other silly references. A respectable email address is simply your first and last name. It’s not all that impressive if you played a lot of high school sports but never stuck to one. Colleges would like to see if you are dedicated to any of the extracurricular activities you engage or if you just tried them to pad your resume. Four years of football or drama is a lot better than a long list of activities you engaged in for just a few months. C2 is the smart choice for students who want to do better. We offer customized curricula, personalized attention and a wide variety of enrichment services for students from kindergarten through high school. Give us a call today. Summer activities will do more than just get you out of the house. Boosting your activity level this summer will keep you in shape, keep you healthy and keep your mind sharp. C2 Education, your college prep service in Severna Park, offers these fun activities you should try this summer. Spring is in the air, which means summer is just around the corner! What if your summer plans are nonexistent? Isn’t it too late to make plans now? While a lot of summer programs have application deadlines that have already passed, you still have plenty of options. If you’re interested in programs like these, definitely don’t wait to apply – the application deadlines are right around the corner! Interested in combining education and travel? C2 Education has partnered with Oxbridge Academic Programs to offer 7th-12th grade students with opportunities to study abroad. These programs combine the excitement of travel and the value of learning. Oxbridge Academic programs take place at some of the world’s most renowned universities in culturally rich cities. Students have the ability to earn course credits while gaining valuable travel experiences. Contact your local C2 Education center today to learn more about the opportunities available through Oxbridge Academic Programs. It can be tough to balance school, homework, extracurricular activities, and test prep during the school year. Make sure you’re putting these school-free weeks to good use to boost your chances for college admission. Why not use summer break to focus your efforts on SAT or ACT prep so that you can really maximize your scores? Or you can choose to set up your own rigorous self-study schedule or enroll in a summer test prep program. This summer, C2 Education is offering 40-hour SAT or ACT Boot Camps designed to help boost your SAT or ACT scores in just four short weeks. Contact your local C2 Education center to learn more about these limited time programs. Gaining admission at your dream college requires more than good grades and test scores. Colleges seek students who will develop into leaders who will work to enrich their communities. You can show colleges that you’re invested in making the world around you better by engaging in volunteer work. There are plenty of resources to help you find great volunteer opportunities, but if you’re not already involved in service organizations like National Honor Society, contact your local C2 Education center. C2 Education has partnered with Lion’s Heart, one of only 12 nationally recognized leadership organizations that offer the President’s Volunteer Service Award, to provide students with great volunteering opportunities. Lion’s Heart links student volunteers with hand-picked local volunteer opportunities based on each student’s passions and interests, and provides a platform where students can track their hours, leadership positions, and awards to build a volunteer portfolio to submit to colleges. Contact your local C2 Education center to learn more, and be sure to mention C2 when enrolling at Lion’s Heart. No matter how you choose to use your summer break, make sure you use it wisely! A whole month? I’ve got plenty of time to study! I’ll start next week. Only a month?!? I’ve been studying for weeks, but I’m nowhere near ready for the test! Bet you can guess which camp we think you should be in. For most students in most AP classes, AP exam prep is a marathon – never a sprint. These are intensely rigorous 3 hour exams, and many students will take two of these tests in a single day or several tests in a single week. Unless you’re a lean, mean testing machine, that’s a whole lot of really tough tests to take in a pretty short amount of time. For that reason alone, AP exam prep should be done over the long haul. You wouldn’t start training for a marathon just a couple days before the race, and you shouldn’t start studying for your AP exams with days to spare either. If you haven’t already started your AP exam prep, there’s no time like the present. Go get some pens and pencils and highlighters. We’ll wait. Tip #2: Gather your materials. Most AP exams cover a TON of information. You’ll need a few important things to be able to condense a whole year’s worth of stuff into something you can reasonably study in just a few weeks. First, get all your class notes. Hopefully you took really thorough notes (or perhaps a really generous friend took very thorough notes and will share them with you). One great way to start studying is to condense your class notes into a homemade study guide – basically, take notes on your notes. By rearranging and summarizing information that you’ve already written down once, you’ll help to cement it in your brain. Next, get a good prep book. For most courses, C2 has its own custom books that we use with our students. Our teachers also pull from many of the same prep books you might see on the bookstore or library shelf. Look for a book with a couple of full-length practice tests and thorough chapters on all of the main topics covered on the exam. Finally, get your hands on as many official practice tests as you can. The College Board typically publishes several years’ worth of practice material – both full-length tests and free response practice questions. You might also ask your AP teachers for any practice tests they might have on hand. Tip #3: Take practice tests. One of the hardest parts of AP testing is simply surviving the rigor of the test. For most AP exams, you’ll be doing A LOT of reading and writing – about 3 hours’ worth. Taking plenty of timed practice tests will help get you ready for the testing marathon ahead. Just as you would build endurance before running a marathon, you’ll want to build endurance before AP exams start. Practice tests also offer a great way to review information and can help alleviate testing anxiety. The more you test yourself on the information, the better you’ll remember it. And the more familiar you are with the test format and question types, the less worried you’ll be on test day. C2 is offering a FREE practice test in the month of April. This is a great chance to get some AP exam practice in. Tip #4: Focus on weak spots but maintain strengths. It’s natural to focus your AP exam prep efforts on the weakest areas, but it’s equally important to maintain your strengths. Let’s say you’re prepping for AP US History, and you feel really good about the post-WWII material that you just finished covering in class, but you can barely remember anything pre-Revolutionary War. If you focus exclusively on pre-Revolutionary War history, there’s a really good chance that you’re going to forget a lot of that post-WWII stuff in the process. When it comes to knowledge, use it or lose it. If you never review or test yourself on the stuff you know well, you might not remember it on test day. Tip #5: Build a support system. You’re not in this alone. Your fellow AP students, your AP teachers, your parents, and your local C2 Education center are all pulling for you. Use these resources to help you through the next few weeks! Put together study groups with classmates, ask your AP teachers for review sessions or testing pointers, get your parents to do flashcards with you, and consider visiting your local C2 Education for some expert AP exam test prep sessions. Get some first-hand AP prep. C2 is hosting four separate webinars covering the most popular AP exams. Learn the ins and outs of each test and pick up some strategies to maximize your time before the exam. Grades are not a measure of a person nor should they be the sole measure of anyone's academic success. Grades are a reflection of how much you have learned, but you can still learn a great deal without necessarily getting high grades. That said, getting good grades is still very important. C2 Education, your college prep and tutoring service in Severna Park, offers the benefits of maintaining good grades. There is a huge difference in how you feel when you get an A and when you get a C. When a student gives the best effort they can, it shows in their grades. And when they get good grades, they are motivated to keep up the good work and remain full of confidence. A student who gets good grades obviously cares about their education and takes schoolwork seriously. In doing so, good students earn the respect of teachers and peers. Even if you don't plan on going to college, studies have shown that students with higher grades in high school tend to be better off financially than those who received poor grades. Some students might feel that grades don’t matter because they are planning on going into a field like sales. Some don’t feel grades are important because they don’t plan on going to college or are going into the military. But if a student strives to do well in everything they do, they will get good grades and be successful in their career of choice. Even if it is in sales. Most small companies don't expect to see your GPA on a resume, but many large companies will require it. This means the difference between you landing a great job at a great company could come down to your grades. If you rely on a professional service to help you land a job, they will certainly want to know what kind of grades you have. Many companies use grades to determine if a student has the technical ability and competence to do a certain job. Getting accepted to a good college is one thing, receiving a scholarship is a whole different matter. The last thing you want after graduation college is student debt. This can impact your life for quite some time. Better grades and higher test scores will help students get more money for college. Speaking of getting accepted to a good college, good grades will land you at the better schools. And if you want to go on to graduate or professional school, your grades are even that much more important. The competition among applicants for college is high and one thing that could set you apart from the others are your grades. A lot of families preparing for college admissions hear a lot about the importance of a college degree. They hear about which colleges will give you the most return on your investment and which major will pay the finest dividends and so on. But what these people don't hear is why college matters so much outside of the tangible metrics. It’s no big secret that having a college education pays off, studies show that college graduates can expect to earn $1 million more over their lifetime than those who just have a high school diploma. Having said that, college isn't cheap and some students will have to take out loans to complete their higher education. It may make some families think twice about the importance of a college education. C2 Education, your college prep and tutoring resource in Severna Park, offers the importance of a college education. Nearly 95 percent of adults who have a bachelor’s degree report that they are either happy or very happy with their lives. This compares to 89 percent of those without a college education who are happy or very happy with their lives. In 2016, a report was released by Zillow that found 75 percent of all home buyers were college educated while just over 10 percent had just a high school diploma. The other 14 percent had some college, but did not earn a degree. In addition to the studies that show you will probably make more money than those who only have a high school diploma, earning a college degree is also a recipe for more career stability. Data show that those with a college degree represent under three percent of the workers who are unemployed. In contrast, over five percent of unemployed workers don’t have a college degree. A report in 2016 by Pew Research showed that 60 percent of workers with a bachelor’s degree believed their jobs gave them a sense of identity. The same report showed just 38 percent of workers with a high school diploma had that same sense of identity with their job. Workers who have a bachelor's degree are also far more likely to refer to their job as their career than workers with no college degree. A study by the Lumina Foundation found that people with college degrees have healthier habits than those who do not. The higher your education, the less likely it is that you smoke and have other unhealthy habits. The study also showed that there is a clear relationship between higher education and eating fruits and vegetables, exercising and even wearing a seat belt. Studies show that earning your college degree is good for the community you live in as well. The report found that 40 percent of adults with a bachelor’s degree volunteer in their community while only 17 percent of high school graduates volunteer. As you can see, it is quite clear why getting a college degree is so important. For SAT prep help or college tutoring, contact C2 Education today. You may recall the scene from the movie, “The Matrix”, where Laurence Fishburne’s character (Morpheus) says, “The matrix is everywhere. It is all around us.” You might be asking yourself the following - what is a matrix and how does it relate to math? Not too long ago, matrices (plural of matrix) were a regular part of a student’s high school mathematics instruction. Some students would have learned about matrices and their operations in Algebra II to be able to solve systems of linear equations using Cramer’s Rule, inverse matrices, and possibly Gaussian elimination with reduced row echelon form. Even some teachers in the past even included matrix operations in Geometry to find the final image coordinates of figures following individual or multiple geometric transformations. These approaches allowed students to eventually be able to solve more complex problems and explore mathematics in more detail. For example in AP Calculus BC, matrices can be an efficient tool when performing partial fraction decomposition to make a complex rational expression easier to integrate. Beyond calculus, there is a whole course colleges offer devoted to Linear Algebra that studies linear equations and functions as represented by matrices and vectors and their extensions to various realms within mathematics and beyond. For example, cryptography sometimes uses a process of substitution ciphers and invertible matrices to break or decode encrypted messages. However due to the recent implementation of the Common Core State Standards, there was a restructuring of math content in Algebra I, Geometry, and Algebra II courses. As a result, systems of linear equations and inequalities mainly to Algebra I - a course that PARCC-assessed and an exam whose passing score first became a Maryland high school graduation requirement last year. Despite the Common Core State Standard HSA.REI.C.9 stating, “Find the inverse of a matrix if it exists and use it to solve systems of linear equations (using technology for matrices of dimension 3 × 3 or greater),” the standard has a (+) sign in front of it - which means the standard is targeted for advanced courses. However, this means that matrices will likely be non-assessed on PARCC and therefore likely to not be taught to your child. While systems of equations and inequalities are likely to be revisited to some degree in Algebra II, most of the focus in that course is now being able to solve nonlinear systems graphically and algebraically; thus reducing the likelihood of your child receiving instruction regarding matrices. Currently, there are only a handful of schools in our area (public and private) that are teaching matrices in any of their mathematics course offerings - and in most of those cases, only to a select group of students (namely, Algebra II Honors). This begs the question - what’s the big deal about matrices likely not being in your child’s high school mathematics curriculum? Students will understand and reason with numerical quantities in many forms, including integer and rational exponents, and vectors and matrices. The student will find solutions to systems of equations, even when represented by simple matrices, and apply their knowledge to applications. While matrices are not a significant point of emphasis within the Math section of the ACT exam, at least one question involving matrices have been tested on several of the recently released ACT exams and administrations. Why is this important? Why have I spent all this time reading about something that may be asked perhaps only once on the test, if at all? Answer: Every point on the ACT matters. Getting a question wrong can be the difference of a whole point on the Math section scale score that is used to calculate your composite score that colleges likely look at as part of your application process. That point could be the difference for admission and/or thousands of dollars in scholarships and grants. While this piece focuses on matrices, there are other items that the Math section of the ACT exam assesses that schools have eliminated or taught to only certain groups of students - such as application and use of the Law of Sines and Law of Cosines (some schools teach this in certain Geometry classes, but many others wait until Pre-Calculus, if at all), and Logic (a staple of Geometry curriculum in the past that I haven’t seen since the change in standards). The same arguments made for matrices could be made for these topics that could have a tangible impact on your ACT score. With the upcoming ACT administration on March 20 offered to all Anne Arundel County Public Schools juniors (as well as future tests available to all public and private school students in April, June, and July), now is a great time to enroll your child at C2 Education to receive high-quality tutoring and instruction tailored to your child’s needs from Dr. Ron, Mr. Josh, and/or myself. Students at C2 Education see on average a seven-point improvement on the Math section of the ACT exam and a six-point composite score increase. C2 Education tutoring services are not limited to the ACT exam, as students average 121 points higher on the Math sections of the SAT exam and a 122-point increase overall. Our tutors also work with students for curricular tutoring in Mathematics (elementary through calculus), English (elementary and secondary), Physics (regular through AP), and college prep. Please give us a call (410-421-8080), an email (severna.park@c2educate.com), or check us out (601 Baltimore Annapolis Blvd., Suite 202, Severna Park, MD 21146) to schedule a time to begin your child’s journey to improved scores and grades with a free diagnostic assessment. This blog post was written by our very own tutor (and math wiz) Jonathan Maggart. It is not uncommon for young people to question the need to go to college. They understand it is expensive and that there might be some debt involved, so they might wonder if it would be worth it. There is no doubt that college is expensive and that students who graduate from college have an average of $28,000 in student loan debt. And there are decent jobs out there that pay very well and don’t require a degree. Perhaps your recent high school graduate is eager to join the workforce and get on with their life and doesn’t want to spend four or more years in school. C2 Education offers tutoring and college prep courses in Severna Park and can tell you the importance of going to college. A college education is one of the best investments you can make in terms of what you can earn every year. Studies show us that those with a bachelor’s degree can expect to earn a lifetime salary of about $2.4 million while high school graduates will only earn an average of $1.4 million over their lifetime. Even better news: A master’s degree could earn you $2.8 million over your lifetime. While there are plenty of jobs out there that don't require a college degree, the jobs you want probably do require a college degree. Without a college degree, you may land a job with a really good company, but be limited to how far up you can move because of your limited education. There are also many companies who only hire people with college degrees. College will do much more than just help you get a better job and better pay, it will help you make better life decisions. College students often develop the reasoning skills that can help out in many aspects of life. These skills will help when making big decisions like buying a house and may even improve self-discipline. College is a good introduction to being an adult. You will be responsible for getting yourself to class every day and keeping track of other commitments. You will have to learn to be disciplined because nobody will be around to make sure you attend class, study for tests and finish your homework. At college, you will meet new and different people from all walks of life. You may join clubs that give you a chance to pursue the things you find interesting and like to do. College gives you the perfect opportunity to reinvent yourself. Since your higher education will provide you with more freedom pursuing the career that interests and inspires you, not only do you enjoy your job more, you have a better outlook on life. All too often, people are looking for a way to get out of a dead-end job, this is why they decide to seek a higher education. When you enjoy a rewarding career, your outlook is optimistic and you are a happier person. If you are interested in college prep or academic tutoring, contact C2 Education today. January is almost over. Will you believe it? We hope you are off to a great start this year. New Year's resolutions can be hard to keep. It takes time to learn new good habits and kick the old bad ones. Here are some tips for keeping your New Year's resolution and goals. For example, basic resolutions like staying focused, being healthier and being more positive are great for personal growth. Your resolution does not have to be epic or big. New Year’s resolutions are all about moving your life in the right direction. Making changes in your mindset or lifestyle will pay off in the long run. January can be an overwhelming month. Too often, we reflect on past mistakes and stress over future goals. Unfortunately, obsessing over either can leave you feeling depressed and frustrated. Instead of living in the past or worrying about the future, try getting it all out on paper. Write down all of your concerns, lessons learned and everything that you hope to achieve this year. Journaling is an excellent way to do this. Reflect on how you’re doing without obsessing and be self-aware. Once you decide what you want to accomplish, put a date on each goal. Again, having a journal for your goals is a good idea. If you miss a deadline, do not beat yourself up. Just set a new date and be persistent! Push yourself but at the same time, be realistic about how much time you will need. Try turning your New Year’s resolution into a bunch of small goals with dates and pacing yourself. Once you’ve decided what you want to achieve, write your goals in your agenda. For example, if your goal is to get a higher ACT score, you will write in your agenda the days and hours you will be test prepping. It’s important to be consistent and your daily planner will help you stay on track. 2018 may not be here yet...but it’s going to be here in two weeks. Now is the time to plan for your best year yet! Here are six quick tips for a phenomenal new year. Think about what you want to accomplish, not what looks good or what other people think you should do. Focus on your strengths and focus on what you need to improve as well. Don’t just focus on one or the other. The world is super competitive and acknowledging your weaknesses is super important when goal setting. You want to have the edge! For example, if you’re good at writing but bad at math, focus on conquering math first. You can read and write all you want--but if you ignore your math problems, your GPA and ACT/SAT scores will suffer. Focus on one concept at a time, just as you would focus on one grammar rule if you were having trouble with English. Instead of constantly saying “I’m bad at math”...say “I’m working on my math skills”.By reframing your mentality, your self esteem will improve and you will feel more motivated! Being tech and social media savvy is an asset. It’s also good to stay up to date and be ahead of tech trends for 2018. There is also the intersection of technology and education. If you are not into technology, 2018 is the year for you change that. There are many innovations on the forefront and there is a big demand for coders and techie’s! Instead of setting one huge goal...set 10-12 small goals to achieve your big goal. Monthly goals are great too. Think of them as mini victories! It’s easy to fall off track, especially in January. The new year seems promising but it’s easy to get distracted. To stay focused, come up with a timeline and dates to accomplish each goal. You can write these in an accountability journal. If you don’t make the deadline, no worries! Just rewrite the date and don’t beat yourself up over it. What’s more important is having momentum and confidence! Getting back up and being persistent is more important than being perfect. Successful people aren’t flawless. They make mistakes but they keep going and never give up. This could mean surrounding yourself around motivated friends, joining a study group or having a partner to hold you accountable (accountability partner). It has been scientifically proven that people do better in life when they surround themselves with motivational, positive people. You are who you spend your time around. Choose your company wisely and if a friendship is not working out, have the courage to say “no thanks”. Train your brain to retain information by working towards your goal everyday. Whether it’s an education goal, a fitness goal or a passion project...work on it everyday! It’s better to work for 30 minutes to an hour daily than trying to cram everything in one day. Everyone is different and of course, some may prefer to work for longer hours. Try different things and see what works. One thing’s for sure...the more often you work, the better results you will get. Advanced Placement (AP) is a program that offers college leveled classes that you can take in high school. There are many advantages to taking these classes! -Colleges love to see AP classes because they are challenging and show that you can manage the course load. -AP classes are great for your GPA too! They make your weighted GPA go up. A weighted GPA runs on a higher scale than the regular 4.0. -You can choose subjects you know you’d be good at. You do not have to take all AP classes. Instead, you can just take the ones in areas that you are strong in. -AP classes help prepare you for college. When you take an AP class, you are taking a college level class. Your strengths- which classes would you score high in? Are you performing at your grade level? If you are struggling, it's best to get caught up then consider taking more advanced classes. If you are doing well, do you need to be challenged? AP classes don't just put you ahead of the game, they also offer an exciting challenge! Your goals - what kind of university do you want to get into? Are you aiming high? If your dream school also happens to be a top school, you may want to consider taking AP classes to have an edge over the competition. Time- are you juggling many responsibilities and extracurricular activities? How much time are you willing to put aside to study. Are you going to be able to study the required hours? Your GPA- How high do you want your GPA to be? Remember, AP classes can help you GPA but you must put in the work. You have to be willing to work hard because the classes are more advanced. Vocabulary flash cards are great for improving your vocabulary. You can make your own with common ACT/SAT words or you can buy them on Amazon. The best thing about flash cards is that they are portable, so you can practice anywhere! Put aside a hour everyday to practice your ACT/SAT vocabulary skills. The more you practice taking the test, the better you will be. Like a muscle, you need to practice the test to ace the test. It’s easy to get overwhelmed by a long or complicated reading passage. To save time, underline the most important parts of the passage. What you want to get is the main idea. There are two things that you have to worry about when you take the ACT/SAT reading test: the answer to the question and the actual question itself. It’s easy to get caught up in the answer that you forget the details of the question to begin with. Even if you have to reread...make sure you are clear as to what the question is asking. Unlike math, multiple answers on the reading test may look correct. Remember, there is only one right answer. Read all of the choices and select the answer that best fits the question, not your own opinions of the passage! In addition to flash cards, classic reads are a great way to brush up on your vocabulary. Reading classic or good literature has been proven to increase test scores! Reading is a great supplement to studying. If an oddly worded question is throwing you off your game, take a step back and focus on the main idea of the question. If you have to take notes and rephrase the question...do it!! It’s your test and you need to understand what’s going on. Everyone makes mistakes! 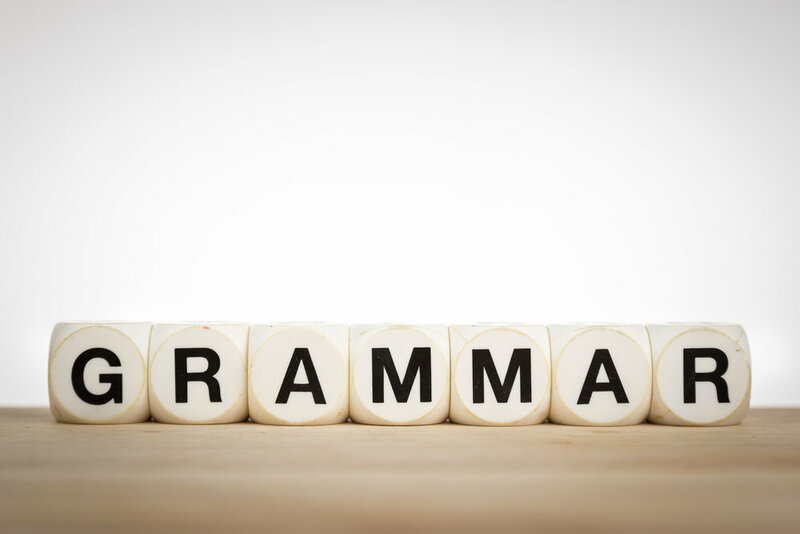 Here are five common grammatical errors and ways you can fix them. Don’t lose sight of why you write: to clarify your ideas. You do not want your sentences to be confusing or wordy. This is a common problem. Stick with one tense and double check to make sure you’re being consistent with your verbs. Incorrect: I went to the movies last night and enjoys the exciting ending. Correct: I went to the movies last night and enjoyed the exciting ending. This one is possibly the worst offence, because run-ons are painful to read and are confusing. The longer the run-on, the less clear your ideas will become. To fix this problem, you may have to reconstruct your sentence and delete multiple words. When in doubt, cross out the run-ons and start from scratch! Incorrect: I went to play basketball with my friends because they were bored and wanted to go outside because we are full of energy so we are busy bodies and always have to be moving around and releasing energy. Correct: I went to play basketball with my friends because we were bored and wanted to get out of the house. We are an energetic bunch and have to be in motion. The dreaded comma splice happens a lot. The comma splice is the incorrect use of a comma to combine two independent clauses aka sentences. For a quick fix, you can just use a semicolon (;). You could also just write two short sentences or combine the two ideas with words like “and” or “because”. Incorrect: I love my pink sweater, it’s so cute. Correct: I love my pink sweater. It’s so cute. Also correct: I love my pink sweater because it’s so cute. This common mistake is easy to spot. Usually, the sentence will sound kind of funny. Make sure you use the correct form of the verb for the subject. Also make sure you pay attention to whether the noun is singular or plural! To learn more, google “subject verb agreement” and learn what goes together! Incorrect: The dogs chases the cat. Correct: The dogs chase the cat. Also Correct: The dogs are chasing the cat. In everyday speech, faulty pronouns are not as noticeable. “It” especially gets thrown out a lot in everyday conversations. Sometimes we use them grammatically correctly and other times we don’t. It happens! When faulty pronouns are used in writing, however, they are more noticeable. To fix this offense, make sure your pronouns are clearly connected. Incorrect: Take the clothes and hats out of the drawer and then fix it. Ask yourself: What is “it”? The clothes, the hats or the drawer? Correct: Take the clothes and hats out before your fix the drawer. Suggested reading: For a fun read for all ages, check out “Super Grammar” http://www.supergrammar.com/ Available at your local library and bookstore! Struggling with grammar? Call us at 410-421-8080 to learn about our one-of-a-kind writing program! The ACT essay is not just part of your overall test score, it’s a writing sample that the colleges can look at. This writing sample can weigh heavily because unlike your entrance essay, you received no help and performed it in a testing environment. Your ACT essay shows how you perform under pressure and reflects your critical thinking skills. These seven strategies will help you up your ACT writing score. You will have 40 minutes to complete this part of the test. Make the best use of your time by staying organized. Underline, brainstorm, and make a simple outline for your paper. Plan out your points and what arguments you will be taking. This part of the test will show how you are able to argue from different perspectives. To score those 12 points, you must understand all of the perspectives that are given and write effectively. Make sure you comprehend what is going on before even choosing a perspective or writing your essay. All too often, students thinking writing long, wordy papers with big words will result in a higher score. Actually, it results in the opposite: a confusing, unclear, unpersuasive paper. Instead of using big words, which often are Latinate and have obscure meanings, try using shorter more specific words. This makes it easier to express yourself. Also, clean up your paper. Wordiness is not your friend. If you have trouble expressing a thought, stop overthinking and sum up the idea in basic language. 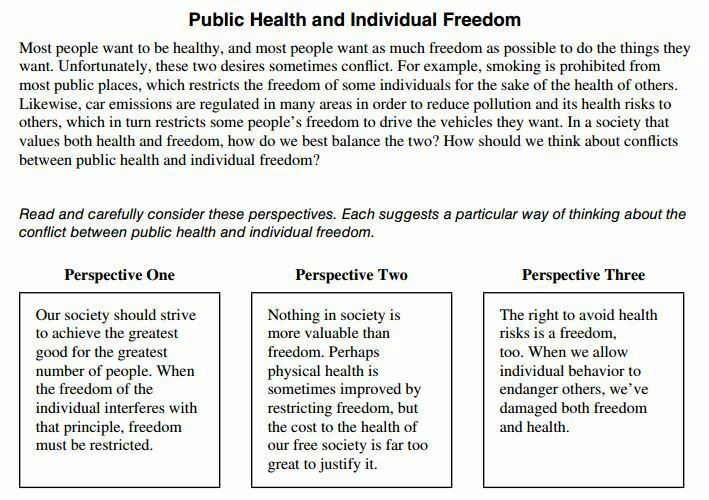 State your perspective clearly and analyze how your perspective relates to at least one of the three perspectives given. 3. Pay special attention to how you start and end your paper. First impressions matter. Make sure you focus on all parts of your essay, not just the middle. With a captivating introduction, you will wow them. Make sure your paper is well-written and logical. If you are pressed for time, make sure you start and end your paper well, because you will be penalized if you are without a thesis and conclusion! 4. Don’t forget your transitions! Remember to use transitions throughout your paper whenever you change topics or introduce a new idea. 5. Allow time to edit your paper. This may sound like a common sense but in the race against time, it’s easy to let a few grammatical rules or spelling errors slip. Don’t let it happen! Allow yourself enough time to re-read your essay. Remember, if your essay is full of errors and grammatical drama- you will lose points. You don’t want that. It’s important to write at least two pages. To add length to your essay, make sure you are specific and give lots of details. Remember that if you are doing an introduction/thesis, opposing perspective, multiple body paragraphs and a conclusion- you can easily write a three page essay. Make sure you follow a consistent format, use transitions and develop your ideas well. Push yourself and don’t be afraid to go long. That’s why they give you all of that paper! 7. Avoid clichés and essay filler words. Millions of high schoolers take the ACT every year. Stand out by avoiding clichés and “essay filler” words. It’s time to put your paper on a diet and clean up your vocabulary. Essay filler words are words that are either vague or add little to your argument. They are also words that are overused in general. These words are sometimes unnecessarily long or have too many definitions. Though some of these words may sound “smart”, ask yourself if they really mean anything. Are they helping you or hurting you? Time is limited and these words can cost you time too. Examples of filler words are: principle, element (and we are not talking science here), approximately (instead of about), excellent (use of this word does not guarantee an excellent test score), and convoluted (unfortunately this word sounds just like its definition). Remember, you want to use easier to understand, shorter words. This way, you can be more specific and your paper will definitely stand out in a sea of wordy essays. The best way to do this is to know what you are talking about. The solution is as easy as that. Are you struggling with writing? Call us at 410-421-8080 to learn more about our one of a kind tutoring program.